First off, this page is not to be seen as a complete listing of Soviet and Soviet influenced chip designs. It does contain the most notable CPUs made (or cloned) in Soviet and WARSAW Pact countries. 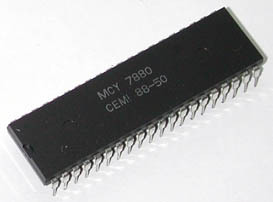 While the boom of the CPU really hit the US in 1970 it wasnt until the 1980s that the Soviets could get things going. They lagged American technology by 10-12 years by the best estimates. 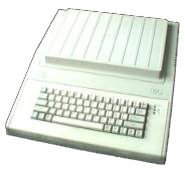 For example, the Bulgarian cloan of the Apple II was popular introduces in the early 1990s. 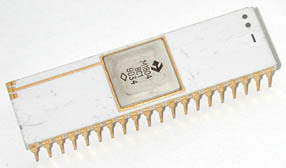 Most of the Eastern chips are clones of Western designs. Often reprints of the original die mask, or simply (easier said then done) reverse engineered. THis is not to say that the Soviets did not do any of their own design. There are several chips which have no western equivalents. 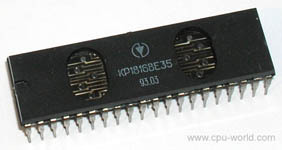 The 1804 is a PDP-11 on a chip, which is really a pretty neat chip. Soviet Packaging, possibly some of the best looking packages around. The Soviets used a lot of gold (they have huge reserves of it so it is no wonder) and white ceramic in their packages. They used such materials all the way through the 1980s. This makes collecting Soviet chips even more exciting. The process technology is also much larger (6 Micron +) on most of these chips so you can easily see the die features. In the past and to large degree at present, scientific projects and industrial enterprises depend on manufacturers of simple microprocessors located in the republics of the former USSR namely Russia, Belorussia and Lithuania. These components do not correspond to the up to date level. Many more even do not correspond to the current level of microprocessor components produced by Ukraine enterprises. Among the main enterprises in Ukraine are " Kvazar" in Kyiv, "Gamma" in Zaporizja and "Rodon" in Ivano-Frankivsk, "Kvantor" in Kiev. As well as the "Elektropribor" - Central Scientific and Research Institute (CSRI) in St. Petersburg. There was also the Dnepr Plant in what is now Belarus. UNITRA-CEMI Was a Polish company based in Warsaw. 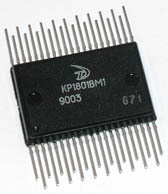 1801VM1/2/3/4 is a series of DEC (PDP-11) compatible microprocessors developed in Soviet Union. 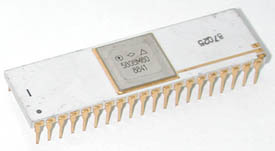 The first processor from this series 1801VM1 could address 64 KB of memory and executed up to 500,000 register operations per second. Next version of this microprocessor (1801VM2) was twice as fast, and included new instructions: integer multiplication and division, shift right, and 4 basic floating point operations that required external ROM - addition, subtraction, multiplication and division. 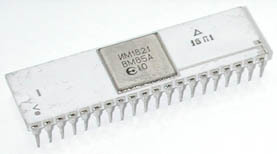 1801VM3 microprocessor was enhanced even further. The processor addressed up to 4 MB of memory, was 50% faster than 1801VM2, and supported external co-processor. 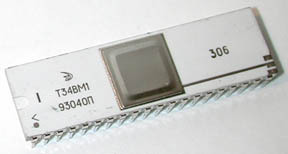 Soviet clone of Intel 8080A processor. 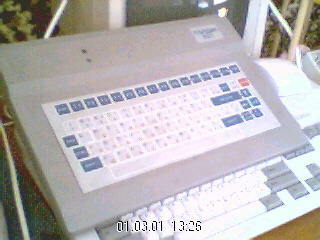 Manufactured by production association "Elektropribor" and "Dnepr". 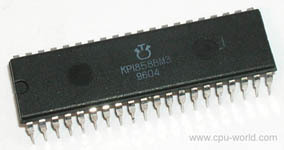 Used in the Pravetz-82 (Code name: IMKO-2) Computer (Apple II Clone) and Pravetz-8A. This list is not complete but is meant to give you an idea of what is was going on outside the US. I would like to thank Genna of CPU-World and Frassal (from Germany) as for their pictures that made this possible.